Ki-67 antigen is a nuclear, non-histone protein that is present in all stages of the cell cycle except G0. This characteristic makes Ki-67 an excellent marker for proliferating cells and is commonly used as one of the prognostic factors in cancer studies. A correlation has been demonstrated between Ki-67 index and the histo-pathological grade of neoplasms. Assessment of Ki-67 expression in renal and ureter tumors shows a correlation between tumor proliferation and disease progression, thus making it possible to differentiate high-risk patients. Ki-67 expression may also prove to be important for distinguishing between malignant and benign peripheral nerve sheath tumors. Ki-67 labeling index has been shown to be a prognostic marker in a number of neoplasms including grade II astrocytoma, oligodendroglioma, colon carcinoma, and breast carcinoma. 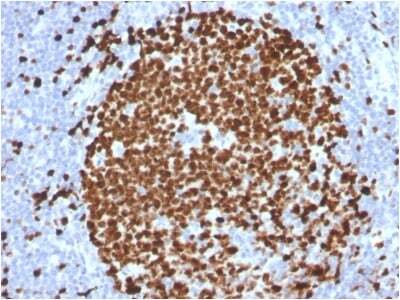 In general, Ki-67 is a good marker of proliferating cell populations. Small volumes of anti-Ki-67 antibody vial(s) may occasionally become entrapped in the seal of the product vial during shipment and storage. If necessary, briefly centrifuge the vial on a tabletop centrifuge to dislodge any liquid in the container`s cap. Certain products may require to ship with dry ice and additional dry ice fee may apply. Formalin-fixed, paraffin-embedded human Tonsil stained with Ki67 Mouse Monoclonal Antibody (MKI67/2465). 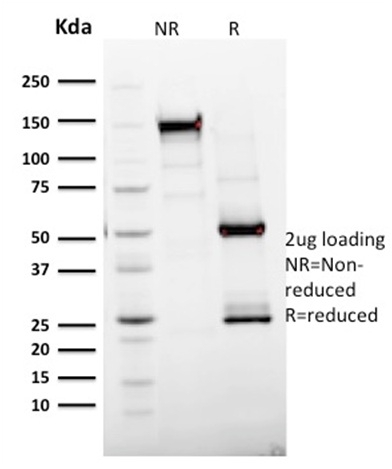 SDS-PAGE Analysis Purified Ki67 Mouse Monoclonal Antibody (MKI67/2465).Confirmation of Integrity and Purity of Antibody. Analysis of Protein Array containing more than 19, 000 full-length human proteins using Ki67 Mouse Monoclonal Antibody (MKI67/2465).Z- and S- Score: The Z-score represents the strength of a signal that a monoclonal antibody (MAb) (in combination with a fluorescently-tagged anti-IgG secondary antibody) produces when binding to a particular protein on the HuProtTM array. Z-scores are described in units of standard deviations (SD's) above the mean value of all signals generated on that array. If targets on HuProtTM are arranged in descending order of the Z-score, the S-score is the difference (also in units of SD's) between the Z-score. S-score therefore represents the relative target specificity of a MAb to its intended target. A MAb is considered to specific to its intended target, if the MAb has an S-score of at least 2.5. For example, if a MAb binds to protein X with a Z-score of 43 and to protein Y with a Z-score of 14, then the S-score for the binding of that MAb to protein X is equal to 29. NCBI/Uniprot data below describe general gene information for Ki-67. It may not necessarily be applicable to this product. Required to maintain individual mitotic chromosomes dispersed in the cytoplasm following nuclear envelope disassembly (PubMed:27362226). Associates with the surface of the mitotic chromosome, the perichromosomal layer, and covers a substantial fraction of the chromosome surface (PubMed:27362226). Prevents chromosomes from collapsing into a single chromatin mass by forming a steric and electrostatic charge barrier: the protein has a high net electrical charge and acts as a surfactant, dispersing chromosomes and enabling independent chromosome motility (PubMed:27362226). Binds DNA, with a preference for supercoiled DNA and AT-rich DNA (PubMed:10878551). Does not contribute to the internal structure of mitotic chromosomes (). May play a role in chromatin organization (PubMed:24867636). It is however unclear whether it plays a direct role in chromatin organization or whether it is an indirect consequence of its function in maintaining mitotic chromosomes dispersed (Probable). Gerdes J, et al. 1984. J. Immunol. 133:1710. Schluter C, et al. 1993 J. Cell Biol. 123:513.